Nine species of bats are considered regular residents of New Jersey. These include the little brown bat, big brown bat, northern long-eared bat, small-footed myotis, Eastern pipistrel, Indiana bat (state and federally endangered), hoary bat, red bat and silver-haired bat. The hoary, red and silver-haired bats are part-time residents that are found here from spring through fall when they migrate to southern states for the winter. The other six species remain here throughout the entire year and require special habitats for winter hibernation. Natural caves once provided hibernating habitat for bats, but today most caves are subject to disturbance by people and thus are not suitable for use by bats. Abandoned mines and tunnels have replaced natural caves as the primary winter habitat for bats in many parts of the country because they are often unsafe to enter or inaccessible to people. New Jersey's largest known bat hibernaculum is the Hibernia Mine in Rockaway Township, Morris County. The mine was abandoned in the early 1900s and the first record of bats using the mine is from the 1930s. In the decades that followed, the mine continued to provide winter habitat for bats but frequent and constant human disturbance limited the mine's potential. Over the years a number of unsuccessful attempts were made by landowners to seal the mine to keep people out. However, sealing the mine would have also made it unavailable to the bats. 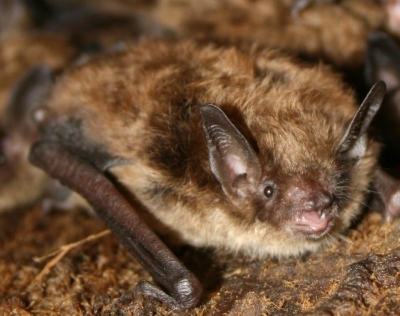 The 2 most common bats involved in nuisance complaints are the little brown bat (Myotis lucifugus) and the big brown bat (Eptesicus fuscus). The little brown bat ranges from 3.1 to 3.7 inches in length and has a wingspan of 8.6 to 10.5 inches. Big brown bats range from 4.1 to 4.8 inches in length, with a wingspan of 12.1 to 12.9 inches. Big brown bats can readily be distinguished from little brown bats in flight by their larger size, slow wingbeats and audible chatter. A single bat that enters a home can often be removed easily. Bats, like all wild animals, may bite when handled and should not be removed bare-handed. 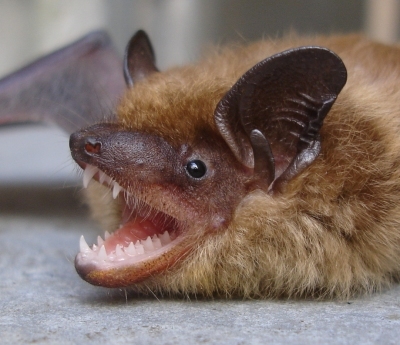 Remember that bats, like other mammals, may be a source of rabies. The rabies virus is found in saliva and may be transmitted through the bite of an infected animal. If you are accidentally bitten while handling a bat, make sure the bat is saved for examination. Also, if the time residing in the living area of your home is unknown the animal should be saved for submittal to rabies testing. If you are bitten, immediately wash the bite with soap and water and seek prompt medical advice. Non-bite exposures can also occur and should be treated in the same manner as a bite. A non-bite exposure occurs when saliva or brain tissue from an infected animal enters scratches, abrasions, open wounds or mucous membranes (nose, mouth, eyes). Most colonies of bats are small and often remain unnoticed for many years. Large colonies residing in an attic or wall may become a nuisance because of noise and unsightly guano accumulations. A thorough inspection of you home should be conducted to determine if the bat that entered was incidental or they are currently roosting there. Eviction and exclusion of roosting bats are the only safe, permanent solutions to a nuisance problem and should be handled by a professional.